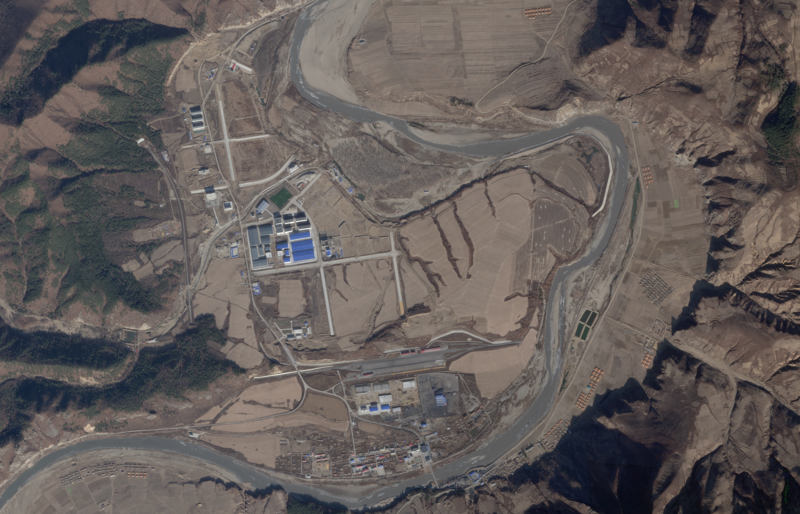 China appears to be engaged in several construction projects of varying sizes along the Sino-North Korea border in an apparent preparation for increased trade and cross-border traffic, satellite imagery taken throughout the year reveals. 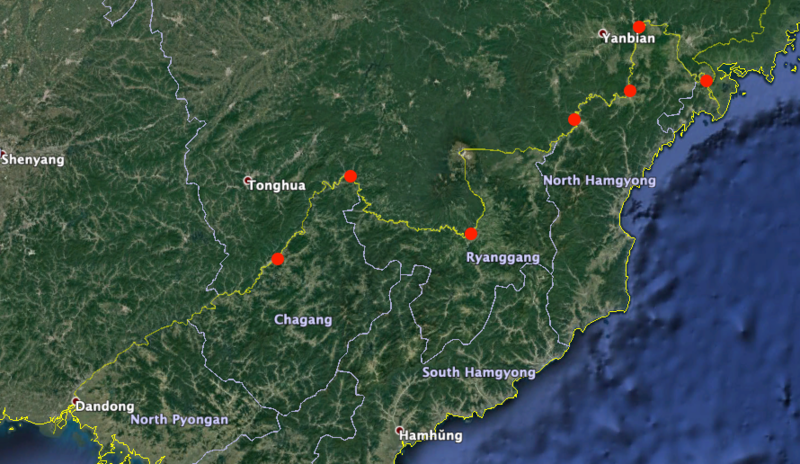 NK Pro analysis has identified seven locations that show signs of infrastructure developments, ranging from renewed maintenance of existing sites to entirely new construction, along the shared border. 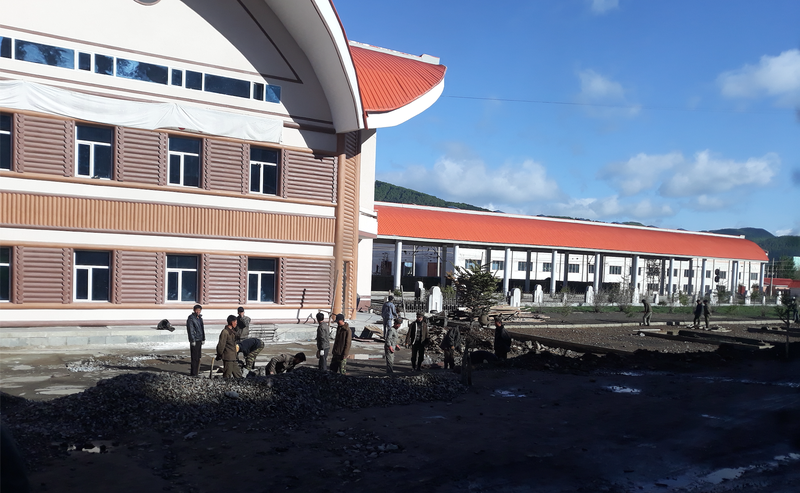 Construction can be observed to have taken place throughout 2018 near the DPRK cities or towns of Manpo, Chunggang, Hyesan, Musan, Hoeryong, Namyang, and at the Wonjong-Quanhe crossing. 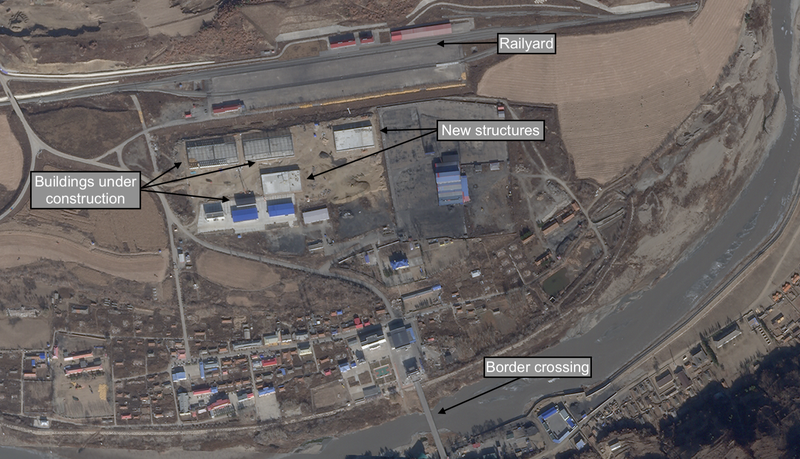 The construction sites are located at key crossing points into North Korea and in the immediate vicinity of customs offices, suggesting a link to bilateral trade. While there appears to be plenty of progress made throughout 2018, many of the projects are pre-existing and some showed signs of consistent developments throughout 2017 and at a pace similar to those seen this year. That such projects were moving with relative consistency in 2017 is certainly notable, considering it was a year dominated by increased tensions on the peninsula and the expansion of UN Security Council (UNSC) resolutions banning significant areas of trade with the DPRK. However, regardless of any restrictions, it appears that Jilin Province is keen to push cross-border trade and cooperation in the near future. The North Korean town of Manpo lies around 200 kilometers from the Chinese city of Dandong and the North Korean city of Sinuiju, both well-known hubs for Sino-DPRK trade. On November 16, the same day that North Korea announced a new weapons test, state media also announced plans to expand Sinuiju and, likely, further its potential to facilitate Chinese trade and investment. On the other hand and, despite the intended development of the Manpo Economic Development Zone, the town of Manpo itself has sat opposite a largely stagnant construction site on the Chinese side of the border just to the east of Jian for a number of years. 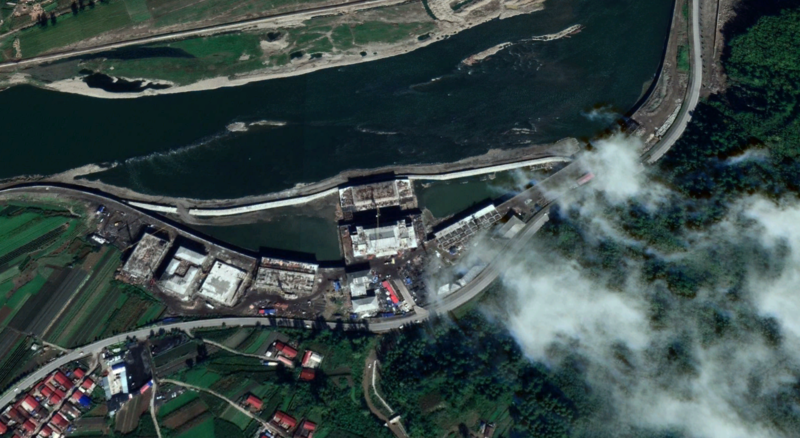 According to Google Earth imagery, and as previously reported by Curtis Melvin, the border bridge from Manpo to the Chinese side first appeared complete in imagery dated December 2012, with little progress on the Chinese side. In 2016 however, increased signs of construction began to appear and what was previously a series of fields were carved out into compounds, with several buildings being partially built within them. The latest Google Earth imagery from September 2017 shows signs of partial road paving and construction underway on several new buildings as well. More recent satellite images from Planet Labs Inc. reveals a range of developments that have taken place over the last 12 months, too. This includes advanced work on the construction of roads within the compound, progress made on the several structures previously undergoing work, and the addition of at least one new building in a lot closest to the river bank. Within this lot, and surrounding a cluster of around nine structures, imagery shows significant paving work has taken place as well, with Planet Labs Sky Sat imagery revealing what appears to be road surface markings. Additionally, on the northern edge of the broader compound itself, a dirt road now appears to be fully paved and painted – better linking the facility to Jian. It is also worth noting that the Jilin Provincial Government recently reported that officials had visited the site called the Jian Border Economic Cooperation Zone, with an apparent picture being taken on the bridge between the two countries. 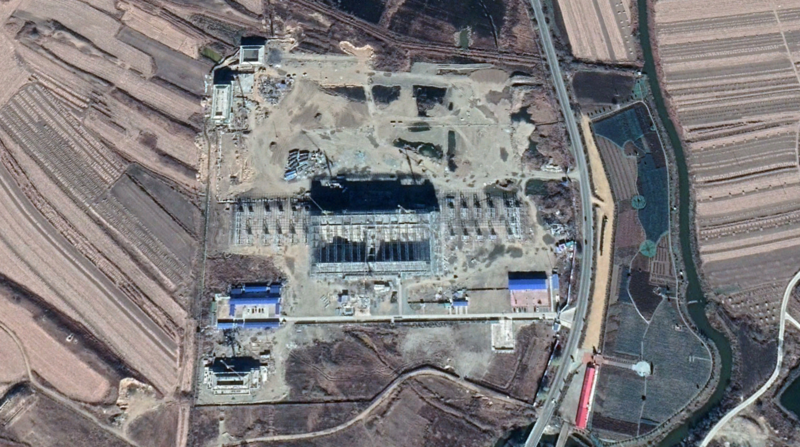 A further 12 kilometers up the Yalu river, additional construction appears to have been completed on the North Korean side of the river at the Munak Power Station. While only a few skeletal building frames appeared to exist in Google Earth imagery taken in May, Planet Labs imagery reveals the construction of around two dozen or more small buildings that appear consistent with housing seen in other areas of the country. The construction of the power station was tracked previously by Melvin and Joseph Bermudez, with the two reporting an estimated cost of RMB500 million. “It is still too early to determine exactly how this new electricity will be used. However, by analyzing the observable existing power grid, it is likely that the power will be linked most directly with Manpho City and the provincial capital Kanggye, with perhaps some going as far as Chongjin,” the two wrote in May last year. Immediately to the east of the North Korean town of Chunggang, a small customs office lies at the base of a thin bridge leading into China and the significantly larger city of Linjiang. While very little activity is occurring around the bridge, significant construction has taken place on the bank of the Yalu River on the Chinese side just under four kilometers to the southeast, with around a dozen buildings being built since the beginning of 2017. Comparison of site one year apart | Photo: Planet Labs Inc.
Over the course of 2018, around eight large buildings have been erected. Two of these buildings, the largest on-site, have been built on the river itself. A river barrier, constructed before January this year, is also present. 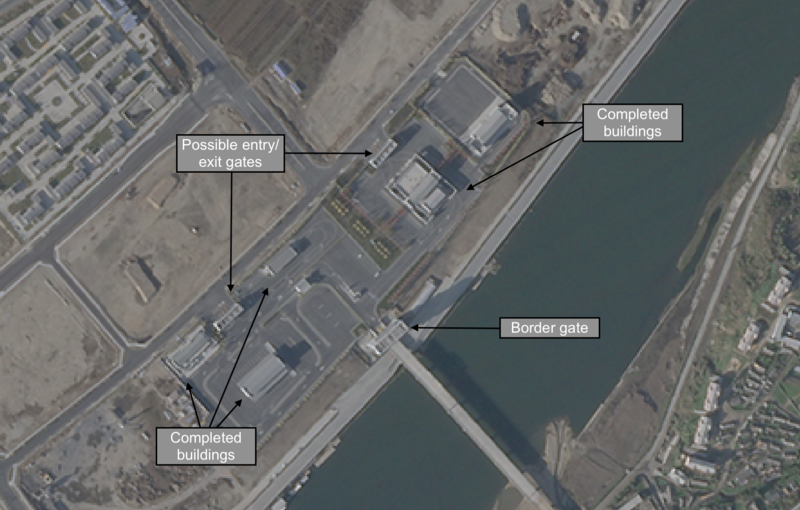 On the North Korean side, the DPRK also appears to have completed some work on a possible river barrier of its own and there are indications of activity on the bank within North Korean territory. More recently in November, Planet Labs imagery also offers indications of activity occurring in the middle of the river with what could possibly be the beginnings of a new bridge linking the two sides, though this is as yet inconclusive. The additional construction of apparent warehouses and buildings can also be seen occurring throughout 2018 in the small town of Linchengcun, which lies between Linjiang and the new structures that have been developed this year. Linjiang is known as a DPRK trading point with a less than reputable image. A Reuters report from the border city in early 2018 called the town “the region’s Las Vegas” and included anecdotes of North Korea prostitution and human trafficking. Currently, three North Korean individuals operating in Linjiang have been designated by the U.S. Department of the Treasury for being representatives of the UNSC and U.S. sanctioned Korea Ryonbong General Corporation (KRGC). Hyesan, a major DPRK border city, has seen multiple changes in the last two years directly linked to wider and significant infrastructure developments inside the DPRK. This year, North Korea has been working towards completing the Hyesan-Samjiyon railway line with the construction of brand new large-scale stations at both ends of the line, with Wiyeon Station being fully redeveloped. Samjiyon is currently undergoing a significant makeover and has been identified as one of the marquee construction projects under Kim Jong Un, who has personally visited the site multiple times. Potentially linked to such projects in 2018, over a dozen apparent large-scale multi-story residential buildings have also been constructed in Hyesan in the immediate vicinity of the new station complex. 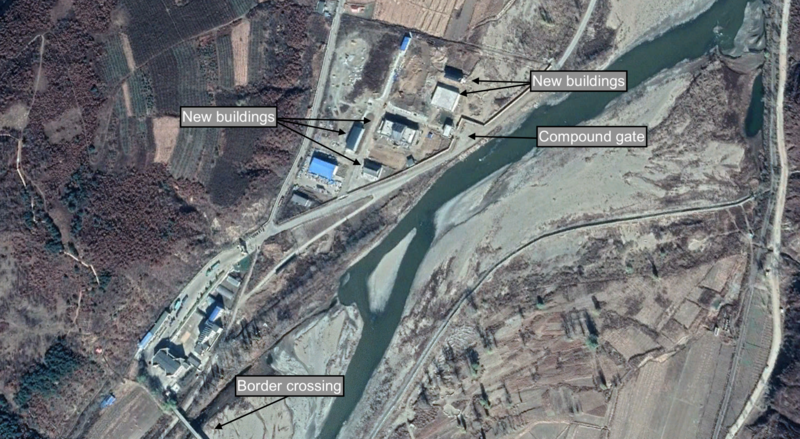 On the Chinese side of the border and immediately across from the DPRK customs office, there have not been significant changes in line with other observed sites, save for the construction of a couple of small buildings close to the river. Having said that, there appears to have been cosmetic and maintenance work conducted at a compound, not dissimilar to that seen near the Manpo-Jian crossing, over the last 12 months. Several roads have been widened or upgraded throughout the year and terrain that could house further buildings appears to have been leveled or cleaned up. Hyeson is also a DPRK-designated Economic Development Zone. The North Korean city of Musan is located near a significant iron mine and, immediately to the north, a border crossing into Nanping, China. Over the last two years, amid North Korea’s WMD program development and weapons testing, the scope and scale of UNSC sanctions against the DPRK expanded significantly. Measures restricting North Korean iron exports were first imposed in March of 2016 via UNSC Resolution 2270 and were reiterated in Resolution 2321 on November 30, 2016. Both resolutions, however, included broad humanitarian exemptions that appeared to be exploited throughout. On August 5, 2017, however, the UNSC banned iron and iron ore exports outright with the passage of Resolution 2371. Despite this, China’s construction of what Reuters reported to be a “30 billion yuan ($4.36 billion) development intended to showcase economic engagement between the two countries” continued at varying paces throughout that period. In fact, construction on what appears to be the main part of the project further back from the border began in earnest in 2016 and developed significantly throughout the year. 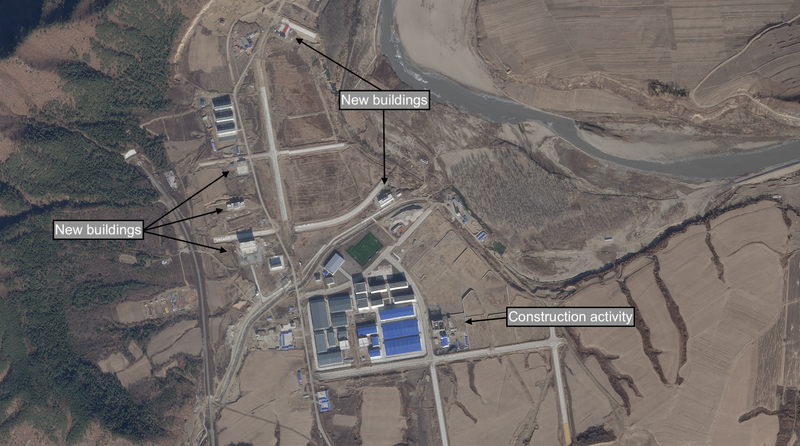 While there were few developments over winter that year – typical of construction cycles in the northern areas of North Korea – further and not insignificant developments are visible in imagery from the first half of 2017. Construction continued with the addition of new buildings and roads around the facility throughout the summer months and up until around October and November 2017. Again a winter pause took place and construction restarted from around March this year. Since then, some buildings appear to have been razed while multiple new structures have been built in the vicinity of the larger apparent compound area. As with other sites observed, new roads have been paved in and around the compound. In the second half of 2018, and much closer to the border than previous construction, as many as six new significantly large buildings have been erected in what was previously identified as a sorting yard for iron ore. The sorting yard is located immediately next to a train station, built between 2009 and 2013, which links the facility to Helong City roughly 35 kilometers North-North-West of Musan. Hoeryong is another major North Korean border city that saw significant redevelopment in 2016 after it was hit hard by flooding caused by Typhoon Lionrock in September that year. Significant numbers of dwellings and buildings close to the border where wiped out and the North Korean Government subsequently built large residential buildings further inland and away from the river. Damage at the North Korean customs office for Hoeryong was clearly visible in satellite imagery at the time as was damage to the Chinese customs office. A section of that land near the Chinese customs office, which at the time of the flooding housed three small buildings, was also damaged. This section of land remained largely untouched, aside from minor post-flooding recovery work, until mid-way through 2017, when one building on the site was razed. Subsequent construction activity then took place in the months of September, October, and November of 2017. While things remained quiet at the beginning of the year over the winter period, subsequent construction in 2018 has resulted in half a dozen new buildings being erected. On the river side of the compound, the Chinese have also built a large wall, most likely intended to mitigate the impact of future flooding and river swelling. Additionally, a new structure at the customs crossing also appears to have been built in the latter stages of this year. Google Earth imagery taken in October and November of 2018 shows sustained construction at the compound as well as indications of sustained cross-border traffic with vehicles and trucks present on both sides of the bridge and at the respective customs offices. 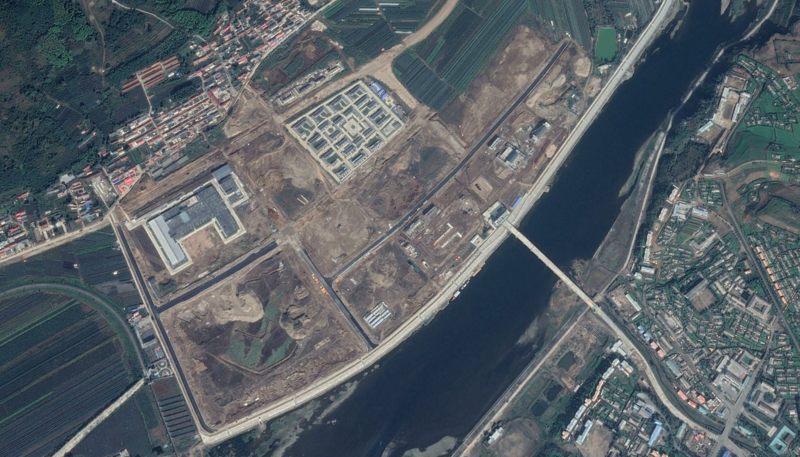 Signs of minor construction work at the North Korean customs compound appears in 2018 imagery, including the building of similar walls and barriers around the facilities there. The North Korean town of Namyang was similarly hit hard by flooding in 2016, with half the town essentially wiped out. Significant new construction was undertaken with large residential buildings going up in a similar style to those seen in Hoeryong. Prior to this year a railway crossing and a single lane bridge have long connected Namyang and the Chinese city of Tumen. However, in 2015 North Korea and China agreed to jointly develop and maintain a new bridge linking Namyang and Tumen. The agreement “was inked by Vice Foreign Minister Pak Myong Guk from the DPRK side and by Chinese Ambassador to the DPRK Li Chenqun,” the Korean Central News Agency (KCNA) reported at the time. 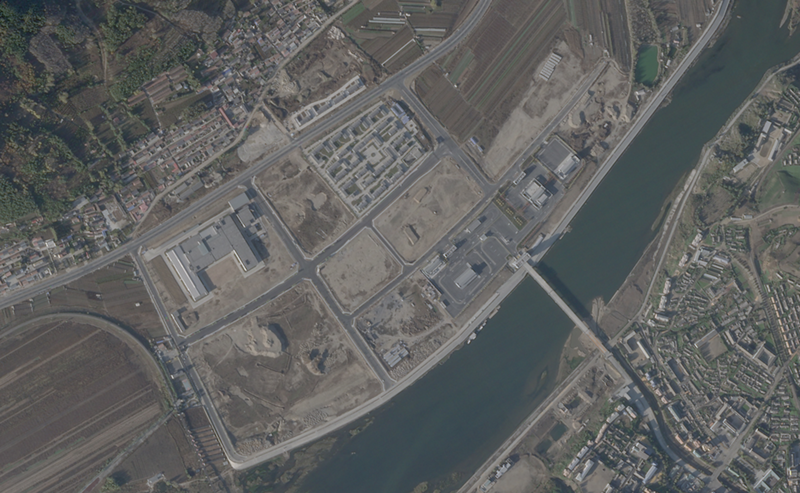 Namyang crossing November 23, 2018 | Photo: Planet Labs Inc. While the foundations for a new multi-lane bridge were erected in 2017, the bulk of the construction occurred in 2018 and has been tracked by NK Pro throughout. More recently, Daily NK published footage of construction workers laying “the final decking” on the bridge on November 10 and subsequently setting off fireworks in celebration. The bridge will no doubt facilitate increased trade with customs offices and facilities located either side. While the construction of the bridge has been the main focus of developments on site, the Chinese have simultaneously constructed a sizeable building in the immediate vicinity of the crossing and on the river bank as well. As with the Namyang-Tumen bridge, North Korea and China struck an agreement to develop a major bridge at the Wonjong-Quanhe crossing close to the intersections between the Chinese, Russian and DPRK borders towards the east coast. The deal signed in 2014 was also concluded by Pak Myong Guk and Li Chenqun. The bridge replaced a much smaller crossing, which was opened in 1997. The crossing links directly to the city of Rason and Rajin port, a key coal exporting facility, via the Rajin-Wonjong roadway completed in 2012. The Rason economic and trade zone is one that the DPRK has long sought to develop. 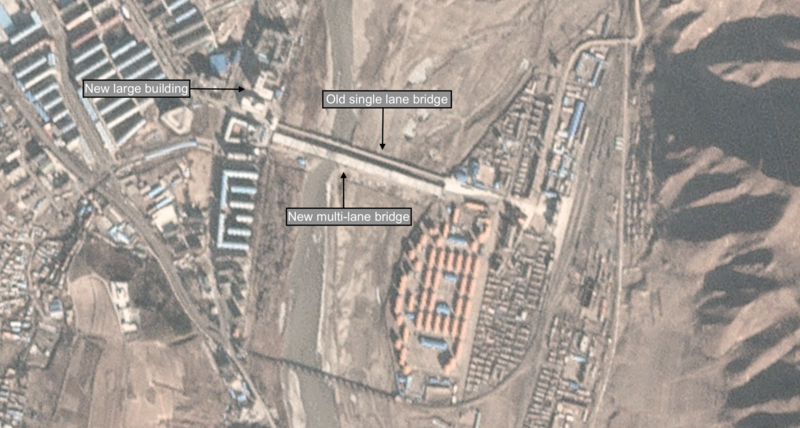 While the new multi-lane bridge linking the DPRK and China appeared mostly complete in 2016, more recently there have been major construction developments on the Chinese side of the crossing. In the first half of 2017, signs indicating the planned construction of a major compound began to appear in an area within a kilometer of the bridge that was previously open farmland. Construction then progressed rather rapidly over the summer months of 2017 as the foundations for what appeared to be a significant structure began taking shape over the months of June, July, and August. By November last year, significant work had been done in time for the typical pause in activity seen over winter months. Work continued from April and additional construction sites appear in the vicinity, with buildings being erected over the summer months again. Several structures on the periphery of the main compound also appear to develop throughout the year. While there has been construction activity on the North Korean side in 2017, there is little activity in 2018. The crossing is already currently being used by both sides with some recent oil-related trade activity reported by NK Pro, however, the construction currently underway is likely a sign that both sides expect things to pick up significantly.